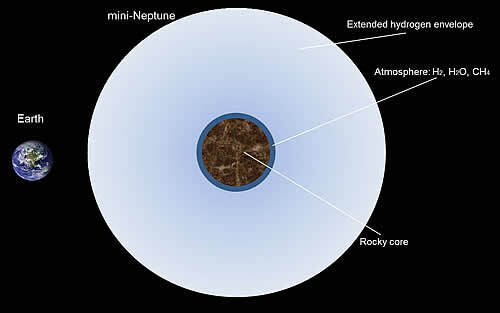 A diagram comparing the Earth, at left, to a cross-section of a super-Earth on the right. The super-Earth has a relatively small rocky core, an atmosphere of methane, water and hydrogen and an extended hydrogen envelope. Credit: H. Lammer. Royal Astronomical Society, UK-(ENEWSPF)-In the last two decades astronomers have found hundreds of planets in orbit around other stars. One type of these so-called ‘exoplanets’ is the super-Earths that are thought to have a high proportion of rock but at the same time are significantly bigger than our own world. Now a new study led by Helmut Lammer of the Space Research Institute (IWF) of the Austrian Academy of Sciences suggests that these planets are actually surrounded by extended hydrogen-rich envelopes and that they are unlikely to ever become Earth-like. Rather than being super-Earths, these worlds are more like mini-Neptunes. The scientists publish their work in the journal Monthly Notices of the Royal Astronomical Society. ‘Super-Earths’ follow a different evolutionary track to the planets found in our Solar system but an open question is whether they can evolve to become rocky bodies like the ‘terrestrial planets’ Mercury, Venus, Earth and Mars. To try to answer this, Dr Lammer and his team looked at the impact of radiation on the upper atmospheres of super-Earths orbiting the stars Kepler-11, Gliese 1214 and 55 Cancri. This group of planets are all a few times more massive and slightly larger than the Earth. They orbit very close to their respective stars. The way in which the mass of planets scales with their sizes suggests that they have solid cores surrounded by hydrogen or hydrogen-rich atmospheres, probably captured from the clouds of gas and dust (nebulae) from which the planets formed. The new model suggests that the short wavelength extreme ultraviolet light (much ‘bluer’ than the blue light we see with our eyes) of the host stars heats up the gaseous envelopes of these worlds, so that they expand up to several times the radius of each planet and gas escapes from them fairly quickly. Nonetheless most of the atmosphere remains in place over the whole lifetime of the stars they orbit. "Our results indicate that, although material in the atmosphere of these planets escapes at a high rate, unlike lower mass Earth-like planets many of these super-Earths may not get rid of their nebula-captured hydrogen-rich atmospheres", says Dr Lammer. Rather than becoming more like the Earth, the super-Earths may more closely resemble Neptune, which together with Uranus, is a smaller ‘gas giant’ in our Solar system. If the scientists’ results are right, then super-Earths further out from their stars in the ‘habitable zone’, where the temperature would allow liquid water to exist, would hold on to their atmospheres even more effectively. If that happens, they would be much less likely to be habitable. The team’s findings will be put to the test in 2017 when the European Space Agency launches the CHaracterising ExOPlanets Satellite (CHEOPS). This will study super-Earths in more detail and should be able to tell whether some of these exotic worlds could one day be more like our own.